The problem with visiting two cities in one day is that you need to get your logistics spot on. To make all of your connections can make the whole trip more hassle than it's worth, in which case a guided tour can be a perfect way to take the stress out of joining all the dots. Madrid to Avila by train: Trains begin early in the morning. Avila to Segovia by bus just after lunch: Book bus tickets. Segovia to Madrid in the evening: The last train is at just after 10 pm. You can, of course, also stay on in Segovia. The city deserves more than half a day. Again, squeezing both into the same day trip can be logistically difficult, so a guided tour is your best bet here. In fact, we wouldn't recommend doing this one at all by yourself, as the train and bus from Salamanca to Madrid usually take around two-and-a-half hours (though there is an infrequent 90-minute train). To make this trip by yourself, you should take the train in all cases, first traveling from Madrid to Avila, then to Salamanca and then - if possible - staying the night in Salamanca before returning to Madrid the following day. There are frequent trains for all routes. The train from Avila to Madrid takes about 1h30 and costs about 10 euros. There are frequent trains throughout the day. Trains from Madrid to Avila depart from Chamartin train station. There are regular buses throughout the day between Madrid and Avila. The journey takes 1h30 and costs about 8 euros. The train is much more convenient and is similarly priced. Book this bus at La Sepulvedana. By car, the 111km journey takes about 1h15. Take the A-6 AP-51 to travel from Madrid to Avila by car. Note that AP roads in Spain are toll roads. 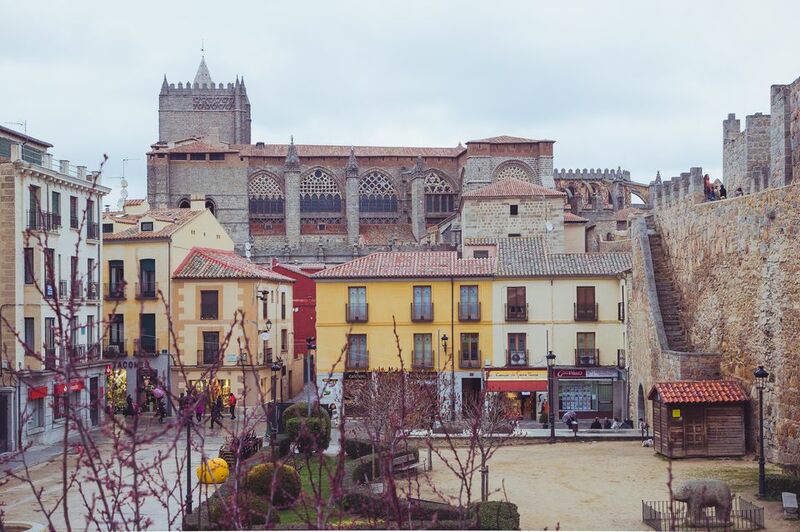 However, if going from Segovia to Salamanca, which is an awkward journey by public transport, you should go from Madrid to Segovia first and then go to Salamanca via Avila. There are several buses per day from Avila to Segovia. The journey takes one hour and costs a little over six euros. Book your tickets with Avanzabus. The 70km drive from Avila to Segovia takes around 45 minutes, via the AP-51. Note: this is a toll road. There is no train from Avila to Segovia. The train from Avila to Salamanca takes around an hour. There are trains throughout the day. No need to book ahead unless you like to have these things all done in advance. The bus takes one-and-a-half hours and costs around 8 euros. You can book from Avanzabus. The drive from Avila to Salamanca takes about an hour, via the A-50.